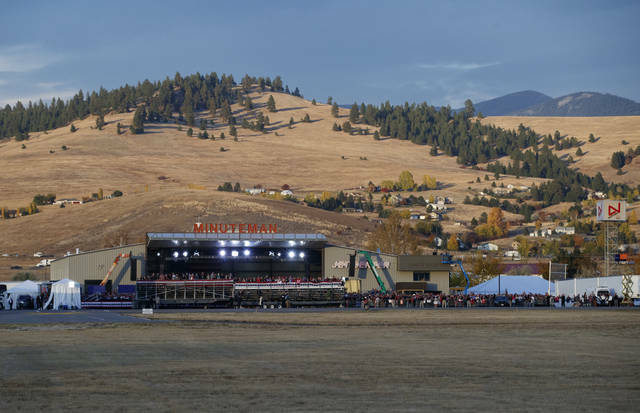 In this Oct. 18, 2018, file photo, a campaign rally is seen from the motorcade, with President Donald Trump aboard, at Minuteman Aviation Hangar in Missoula, Mont. Trump is in the final stretch of a 44-city blitz for the midterm elections, but the America he’s glimpsed from the airport arrivals and his armored limousine is hardly a reflection of the nation as a whole. WASHINGTON (AP) — President Donald Trump is in the final stretch of a 44-city blitz for the midterm elections, but the America he’s glimpsed from the airport arrivals and his armored limousine is hardly a reflection of the nation as a whole. The president has mostly traveled to counties that are whiter, less educated and have lower incomes than the rest of the United States, according to Census Bureau data. It’s a sign that he is seeking to galvanize the same group of voters that helped carry him to victory in 2016. Trump has largely eschewed the big metropolises for smaller cities. He has been to Tampa, Nashville, Cleveland and Houston — where the arenas could accommodate his crowds. But he’s primarily been jet-setting to smaller places such as Elko, Nevada (population 20,078). Or, Mosinee, Wisconsin (population 4,023). Or, Belgrade, Montana (population 7,874). When Trump stops at Belgrade on Saturday, historical records suggest he will be the second president to visit the Montana town named after Serbia’s capital city. In 2009, Barack Obama held a town hall in Belgrade to promote the Affordable Care Act. Trump has journeyed to counties where it’s slightly more of a struggle to reach and stay in the middle class. Out of his scheduled rallies, 74 percent are in counties with median incomes that fall below the national level. But he’s brought tidings of a 49-year low unemployment rate and accelerated economic growth to places that mostly lag the median U.S. household income of $55,032. Just 18.1 percent of the adults in Elko County, Nevada hold a college degree. That’s compared to 30.3 percent nationwide. Of the 43 places Trump is visiting, 28 have a below-average share of college graduates. Elko’s economy is unique because it relies on mining gold, instead of the office and health care jobs that often require a college diploma. The county has five active gold mines, according to the Nevada Commission on Mineral Resources. This makes it something of an outlier in country where mining metal ore accounts for 0.03 percent of all jobs. When Trump has gone to more educated counties, it’s often because they have a major college campus and venues where people can gather. Missoula is home to the University of Montana and 41.8 percent of its adults are college graduates. The University of Missouri is in Columbia, where 46.8 percent of adults hold college degrees. “They want to turn America, these Democrats — and that’s what they want — into a giant sanctuary for criminal aliens and the MS-13 killers,” Trump said. The biggest outlier in Trump’s schedule may be his rally Sunday in Macon, Georgia. Its county is 53.9 percent black, making it the lone place being visited by the president where minorities make up the majority of the population.